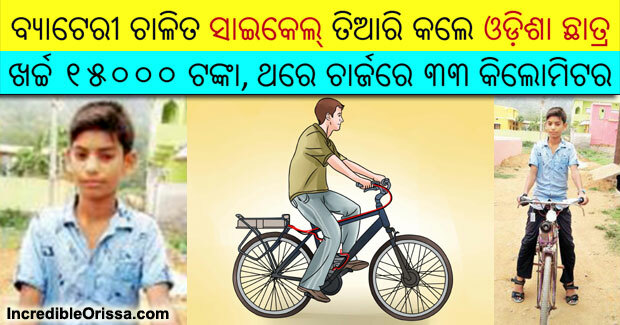 A 10th standard student of the Kendriya Vidyalaya in Odisha’s Deogarh district has developed a battery operated bicycle. Anurag Pradhan, son of Udaynath Pradhan, has developed the battery operated cycle that is giving out a mileage of 33 km. It has an LED light and a horn. Pradhan took one year to develop the bicycle at a cost of Rs 15,000. He used two 12 volt batteries, 24-volt gear motor and 250-watt motor control in the cycle. The student gives credit to his father and friends for his achievement. He said that further research and testing is underway to ride the bicycle through pedal once the battery dies. The development of the battery operated bicycle has now become the talk of the town with people from different walks of life congratulating Anurag for his technical skills.